The Food Network is on a roll it would seem at this point since there are a few shows coming out that are bound to get people excited since some of their favorite stars are starting to entertain ideas that are giving rise to shows that could be a lot of fun to watch. 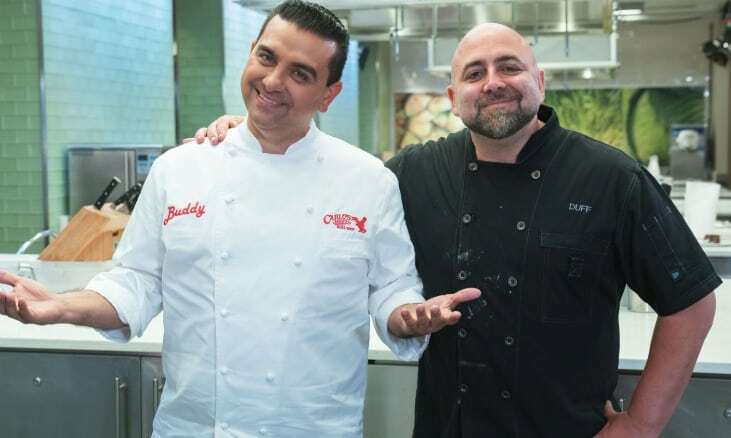 At this point Buddy Valastro and Duff Goldman are bound to go head to head in the kitchen as they bring their insane amount of talent to the screen for people to watch. Ace of Cakes and and The Cake Boss have been widely popular shows that have gained a great following throughout the years and have managed to drum up a great deal of business for both bakers, and as such have made both of them big names on the channel and in their own communities. Now it’s going to be interesting to see just how they measure up to one another and to see who can really take the crown of to baker when the flour finally settles. Here are a few things you might want to know about the show. 10. This will be a series of challenges that take place between the two bakers. You’ve likely seen either Buddy or Duff on their own shows dominating the scene and doing what they know best, but this is going to be neutral ground for both bakers, neither is going to have the advantage coming into this contest, and therefore it’s going to be even more entertaining. 9. There will be two regular judges and guest judges for the show. The judges are going to be as impartial as possible since there are a lot of fans that are likely to go Team Buddy or Team Duff. But just like any show it’s going to be just who can outperform the other in a bid to be deemed as the top dog in their field. 8. Each episode will feature two different challenges for the bakers. There will be two different parts of each episode that will show off their style and skill in a timed challenge that will show just how good they can be and how professional they are under pressure. If you’ve ever noticed they don’t always work under time constraints, so this will be interesting to see. 7. This is the first time that the two bakers have gone head to head. It might be that they’ve met before but Buddy and Duff have never gone head to head and thus this is going to be a meeting of titans in a way since both men are at the top of their game and should be able to wow us all as they strive to be the absolute best. 6. The first episode is going to be focused on family recipes. Given that we’ve seen Buddy touting his family recipes in just about every episode of The Cake Boss it almost seems as though Duff might get overshadowed on this one but there’s also no doubt that he has a long list of recipes to go off of that will keep the playing field level. 5. The show is going to last for six weeks. This makes it seem like it’s going to be there and gone, which it kind of is, but it’s a special show actually that doesn’t really seem like it would be a long-running series. It’s going to be fun to watch all the same but quite honestly it’s bound to be over too quickly. 4. There’s no prize for this, it’s just bragging rights that they’re after. That’s actually pretty cool since there’s no prize, it’s just the bragging rights that these guys are after and a chance to say that they’re the absolute best in their business. Whatever happens though there’s nothing but respect to be had for both of them since they are both highly-skilled professionals. 3. There’s really no need to have a favorite, both bakers are insanely skilled and fun to watch. Some people might want to be Team Buddy or Team Duff since a lot of folks do have their favorites. But again, it’s better to just have respect for both of them since they provide entertainment as well as a lot of helpful hints and tips that people can learn from. 2. The show is starting up on March 10th. This Sunday the first episode will be coming and it’ll be time to tune in and see just who’s going to bring the best they can. Expect both men to bring their A games since there’s no mistaking just how good each of them are. 1. Each show is going to have a different theme. Much as it happens on their individual shows there will be different themes for every episode and the bakers will need to be able to adapt and use every skill they have to impress the judges. It should be a fun show to watch.